Curiously, the military keeps asking us about alleged violations done by the NPA (New Peoples Army -ED.). By all means, resort to mechanisms such as the NDFP-GRP (National Democratic Front of the Philippines – Government of the Republic of the Philippines -ED.) Joint Monitoring Committee to seek investigation on these incidents, and other violations to the Comprehensive Agreement on the Respect for Human Rights and International Humanitarian Law. Our consistent work in exacting accountability from the government is in line with our mandate. We will not be dissuaded from doing such. In any case, the actions of other parties will never whitewash nor diminish the crimes and responsibility of the government towards its citizens. Human rights work will never become irrelevant, unfortunately for people like Parlade and his military crew, as long as individuals like them and fascist governments exist. We are engaged in the exposition of rights violations committed by the government from the organization’s inception, up until today. We have records of the fact sheets provided for by our human rights workers on the ground containing the details of the violations and the perpetrators. Even more unfortunate for Parlade, we have this — atrocities during the time of Arroyo, up until present – on record. Besides, we also engage in human rights training and legislative advocacy, which resulted to relevant laws such as the Anti-Torture Law of 2009 and the Anti-Enforced Disappearance Law of 2012. The statement that the AFP has not committed any rights violation for the past 5 years or more is most laughable. Perhaps, Parlade should be enlightened about martial law violations under Duterte which was investigated and verified by the Commission on Human Rights, including the massacre of an indigenous community in Lake Sebu in December 2017. Karapatan has documented 222 victims of extrajudicial killings in line with the government’s counterinsurgency campaign, 111 victims of torture, around 2,000 illegal arrests and detention, and many others. Likewise, we have a boatload of evidence. Fabrication of evidence and fiction writing is your area of expertise, Parlade. Look at the hundreds of trumped-up charges and even the proscription petition that even the Justice Department admitted lacked veracity. Oh, and the Red October plot? We cringe at this attempt of being a convoluted conspiracy theorist to discredit the legitimate demands and issues raised by the opposition. The military has also eagerly pointed to our engagement with the International League of Peoples’ Struggle (ILPS) as if this is the supreme evidence that will prove their claims. Our international solidarity work with peoples of other countries who bear the brunt of similar fascist regimes is all in the open. 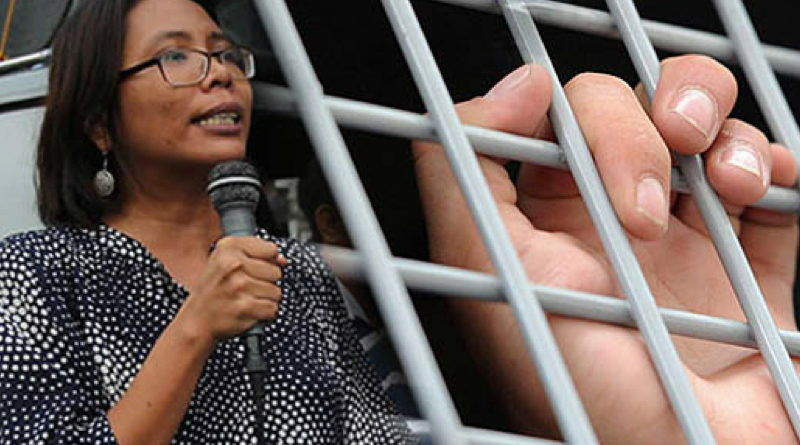 We have released statements in support of political prisoners in other countries who are facing political persecution, and have supported calls for their respective fight for national liberation in public. Indeed, you can check out the link and see our international solidarity work. You can even support it! Again, how this relates to us being a CPP front all comes down to the mention of Jose Maria Sison as Chairperson of ILPS. This “1+1” equation of the military is really the work of some bright minds (sarcasm intended). Continue your defense of the Duterte government, even glossing over the thousands killed during the drug war. The police admitted killing around 5,000, while the rest are labeled ‘deaths under investigation’. Numerous victims and their kin are speaking up. A case against policemen, who included Kian delos Santos’ case as those who died under ‘legitimate police operation’, has been won in court, with the perpetrators set to serve their sentence. Families are now filing counter-charges. You cannot simply put all these irregularities under the rug, when it is presenting itself clear as day. At least 47 of our human rights workers have already died under several governments, Parlade. Our national officers have been put under threat and even our online platform is being compromised by DDoS attacks. Yes, we rally. Yes, we assist victims, their families and survivors to exact accountability. Yes, we file complaints. Yes, we raise these issues in the UN. Yes, we have international solidarity work. Yes, we engage in legislative advocacy. Yes, we work with numerous human rights defenders. And yes, we talk a lot. Many of our colleagues have paid the ultimate price to help us attain the freedoms and rights that this government is denying us. We are committed to pursue their cause.